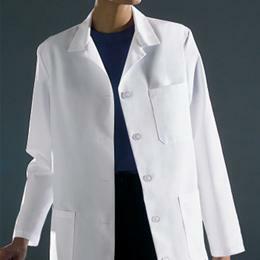 Ladies' Staff Length Lab Coat: 80% Polyester/20% Cotton Poplin. White Button-Front Lab Coat With Pencil Divided Left Breast Pocket; Two Lower Pockets; Princess-Seamed Back With One-Piece Back Belt. Side Slashes For Access To Trouser Pockets. 36" Length.. White, Size 4.